Editor's Note: This blog was originally written for Hotel Arts newsletter. It has been slightly adapted from the newsletter. 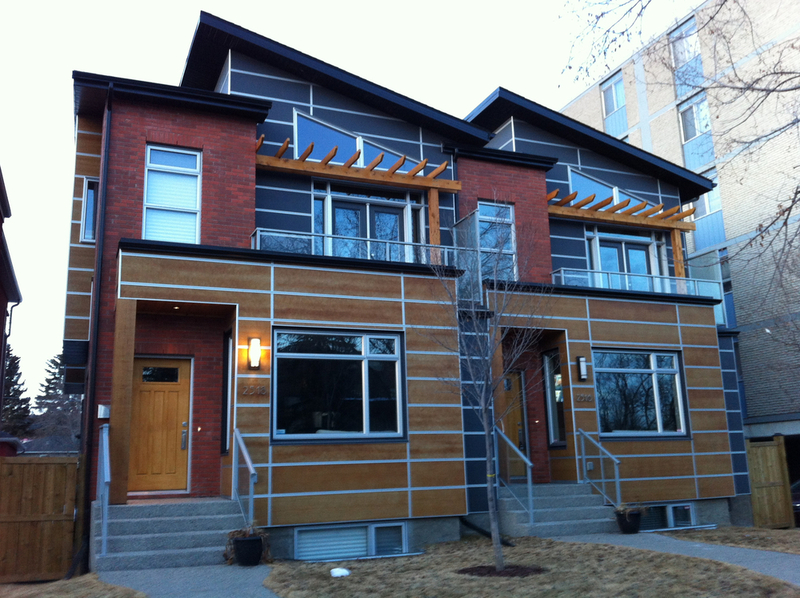 Few Calgarians are aware that along 13th Avenue SW is one of Canada’s most interesting heritage walks. 13th Avenue is not "on the beaten path" most of us drive, walk or cycle along 11th, 12th or 17th Avenues if we are headed east or west on Downtown's south side. 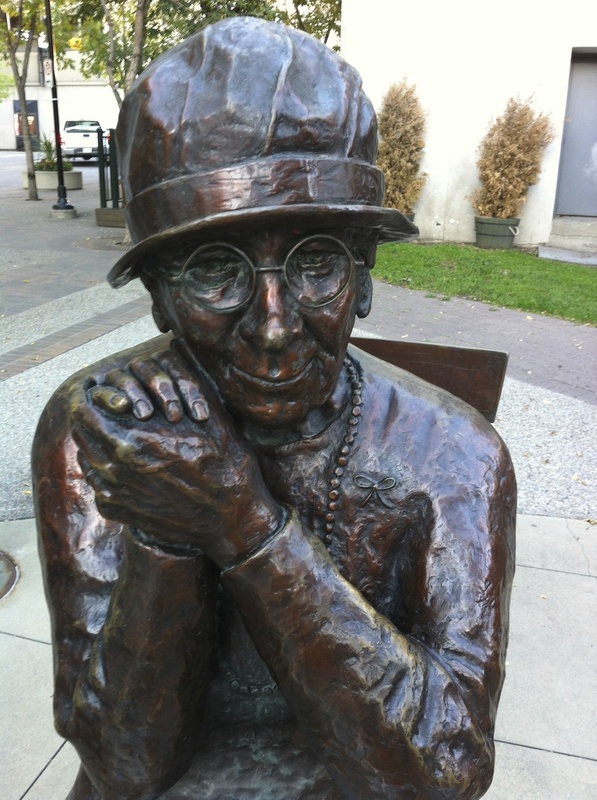 Calgary's Secret Heritage walk is It just 8 blocks long, (2 km) round trip. You could walk it in about an hour depending on how much you want to explore, or you could cycle it in less time. Start the walk at First Street SW and 13th Avenue. From here you have a wonderful vista of the St. Mary’s Cathedral if you look south, but your walk is west along 13th Avenue. (You might want to grab a coffee at the Starbucks before you head out). As you head west mid-block you will be at the quaint Haultain School. Built in 1894, the school is unique in many ways – its Richardson Romanesque architecture, Calgary’s first sandstone school and the first one with electricity and running water. Looking more like a house than a school, it is a reminder that Calgary is still in its adolescence as a city just over 100 years old. Originally named the South Ward School, it was renamed in 1910 after Sir Fredrick Haultain, the President of the Executive Council (Premier) of the North-West Territories Legislative Assembly. 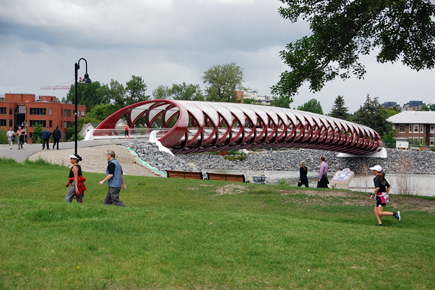 Today, it is home to the Parks Foundation Calgary, which is also unique in Canada with its mandate to foster parks, playgrounds and pathways throughout Calgary. Cross over Second Street SW and you are immediately at Memorial Park with its statuesque trees and iconic Memorial Park Library – Alberta’s first library. Opened in 1912, it is one of 150 libraries built in Canada with funds from the American millionaire Andrew Carnegie. It is a classically inspired two-story sandstone building, sitting on top of a series of granite steps adorned with Ionic Columns and skilfully carved pediment, which combine to create a grand entrance. The building is topped with a low-hipped roof with extensive decoration. Still a public library, wander inside to enjoy the charming details that have been preserved, sit and enjoy a magazine or newspaper of find a great book. 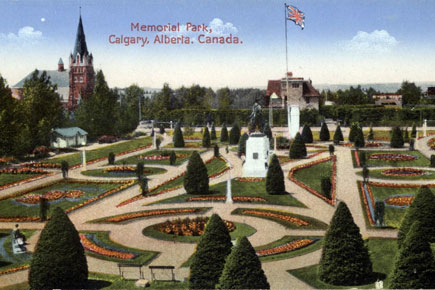 On the other side of the library is the storied Memorial Park, which was originally designed in 1911, by Calgary Parks Superintendent Richard Iverson, after the land was given to the City by the Canadian Pacific Railway for back taxes. The actual development of the park was done by William Reader, Parks Superintendent (1912 to 1942), who created a formal garden with a symmetrical layout, manicured lawns, a mix of domestic and exotic trees and plants, intricate bedding schemes and geometrical walking paths to provide a tranquil respite for urban dwellers. Reader even attempted to grow palm trees in pots as part of creating a unique prairie park. The Park’s “memorial theme” was intended to memorialize British Empire patriotism, with statues and cenotaph. 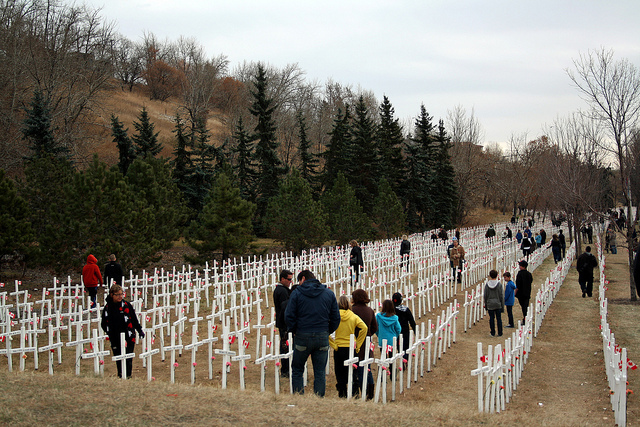 Today, it is used for one of Calgary’s major Remembrance Day ceremonies. The Park was recently given a major makeover, which saw the addition of the fountains and Boxwood Bistro. 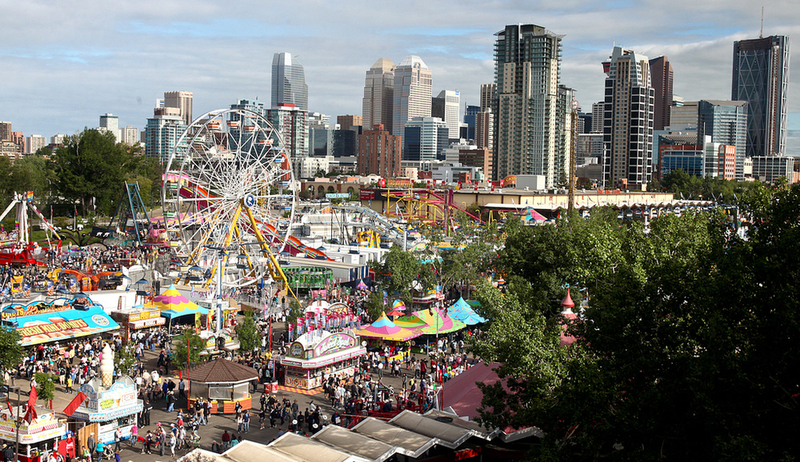 It is also a popular feeding ground for Calgary’s fleet of Food Trucks. Memorial Park in summer is on of the best urban places to sit in Canada. Boxwood restaurant in Memorial Park. Highly recommended. Continuing west along 13th Avenue at 4th Street (yes, there is no 3rd Street) sits the First Baptist Church. It was built in 1911-12 based on designs by architect D.S. McElroy. Many prominent citizens, including Thomas Underwood, a member of the church board, and R.B. Bennett, the City’s acting solicitor, raised money for the construction of the church. Many socially prominent Calgarians worshipped in the church over the years, adding to its historical significance. The building is a very good example of the Gothic Revival style, with its numerous pointed arches, gables, decorated windows, and attached buttresses. The building features a square tower with a spire at the corner. With a capacity to seat 1,300 people, with room in the vestibule for an additional 200 it is believed to be the largest Baptist church in Canada. The interior details are worth seeing, and its exterior is unaltered except for a two-storey brick addition, which was added inconspicuously at the rear in 1951 to house a church youth centre. The amber-toned stained glass windows imported from Germany are part of the original construction of the sanctuary. The three-manual, 42-stop pipe organ which was built and installed by the Casavant Freres Company of St. Hyacynthe, Quebec in 1912 and underwent further enhancements in 1965 and 1992. Currently, the 900-seat acoustically-rich heritage sanctuary supports an adult sanctuary choir, two handbell choirs, a children's choir and a contemporary worship team. Perhaps you might want to consider attending a service if it fits with your schedule. Continue walking west along 13th Ave and you quickly arrive at the grand Lougheed House and Gardens. Built in 1891 and originally known as "Beaulieu", meaning "beautiful place" in French, the Lougheed House is now a national historic site. The mansion was built by Senator James Lougheed for his wife, Isabella Hardisty Lougheed and their two sons, Clarence and Norman. Following the move to the large mansion, four more children were born: Edgar, Dorothy, Douglas and Marjorie. In 1907, the house was enlarged to accommodate the family and their large social calendar. Lougheed House received important state visitors on many occasions. In 1912, the Duke and Duchess of Connaught and their daughter Princess Patricia stayed at the house. 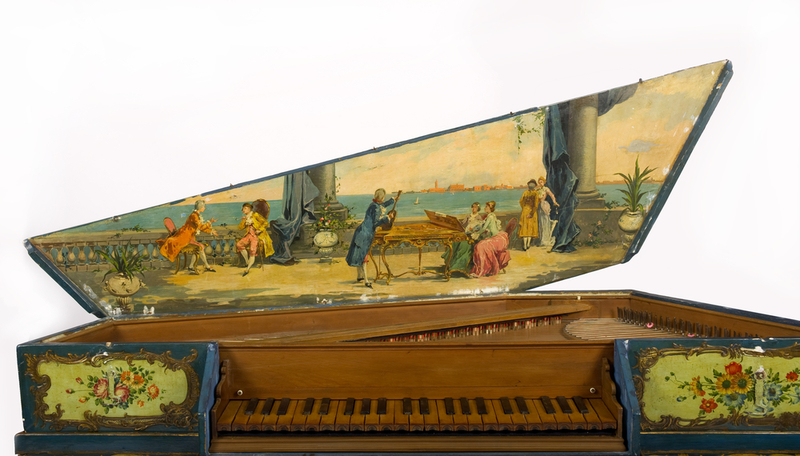 In 1919, the Lougheeds entertained the Prince of Wales at a garden party. Prince Edward visited in 1923 and 1928. Throughout its long history, Lougheed House has been a family residence, a training centre for young women, a women's military barracks and a blood donor clinic. 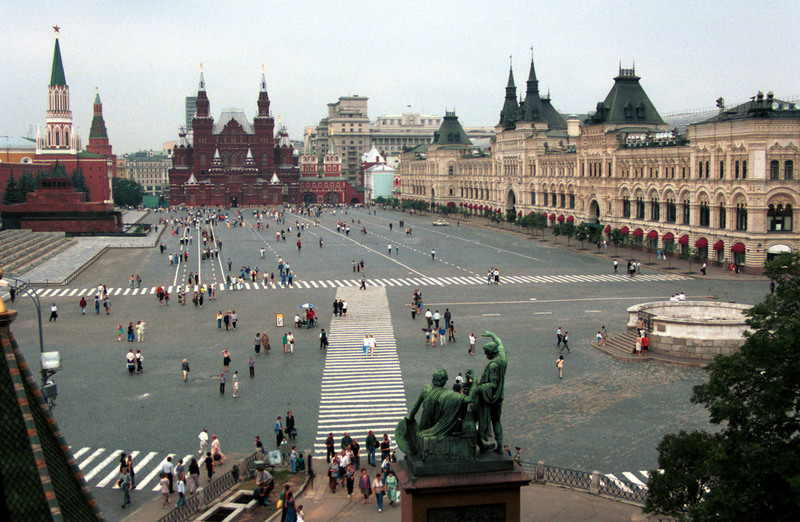 Then, for many years, it sat empty — cared for, but unused until its restoration in 2000. For more information and visiting hours check their website www.lougheedhouse.com. Strolling through the formal Beaulieu Gardens, situated on the 2.8 acre Lougheed estate, is one of Calgary’s best urban pleasures. The Lougheeds were horticultural leaders in Western Canada in their day. The plant material has been accurately restored to the 1891 to 1925 period. Some of the original plantings and garden elements can be seen in the spruce trees, circle flower beds and the balustrades. Directly across the 13th Ave, is the more unassuming Ranchmen’s Club. Established in 1892, it moved to this location in 1914. It is the oldest and most prestigous club in Calgary. 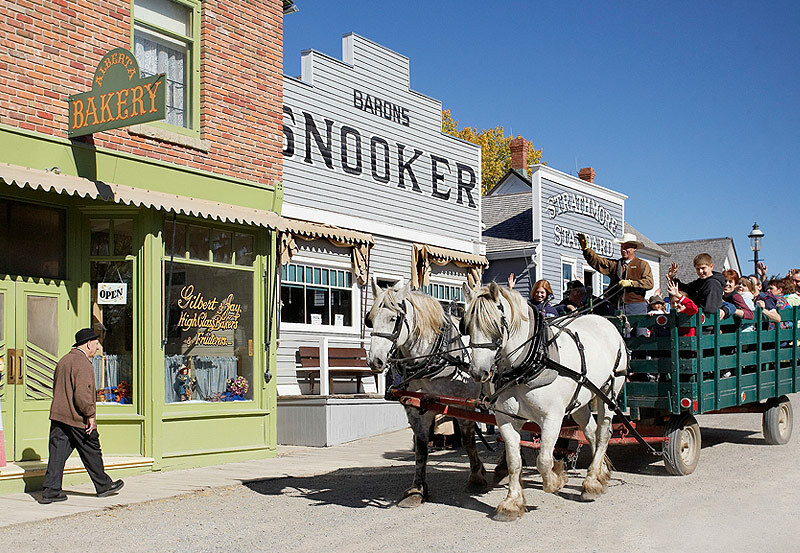 The Club dates back to southern Alberta’s golden age of ranching when cattle barons were the wealthest people in the town. Designed by architect R.E. McDonnell, it is a Renaissance Revival brick building with terra cotta architectural and decorative elements. The interior, as you might expect, features highly detailed wood, leather, stained glass and a remarkable art collection celebrating southern Alberta’s rich ranching culture. The attached 26-story “The Estate” condominium was added in the early ‘80s. Although it is a private club, if you aren’t too shy you could pop your head in and check out the lobby. Continue walking west, past 8th Street, to Central Collegiate Institute (high school), which is now part of the new Calgary Board of Education headquarters. The original building was built in 1908, with a five-room Scottish Baronial-style addition designed by Lang and Major in 1911 and later a William Branston desiged Egyptian Revival style gymnasium in 1940. After numerous different school uses, it closed in 1965 and wasn’t reopened until 1996 when it was leased to Rundle College for a private Jr. High. 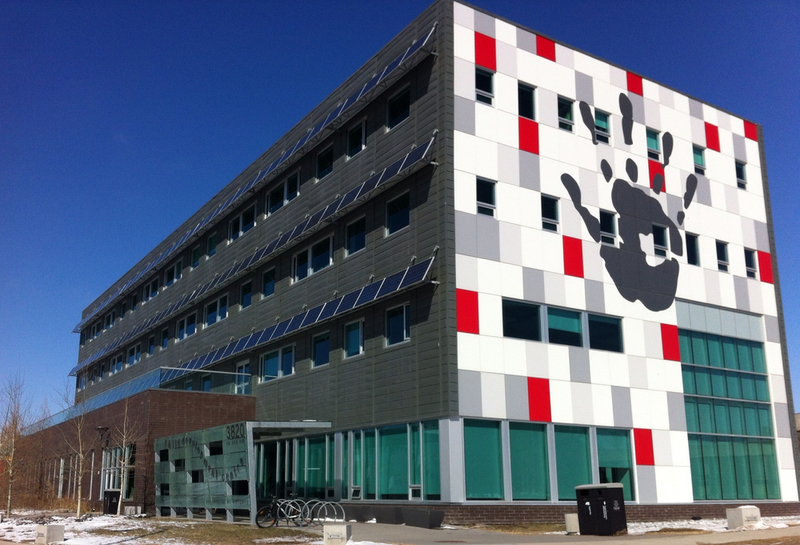 In 2011, it was incorporated into the Gibbs Gage-designed new Calgary Board of Education headquarters. 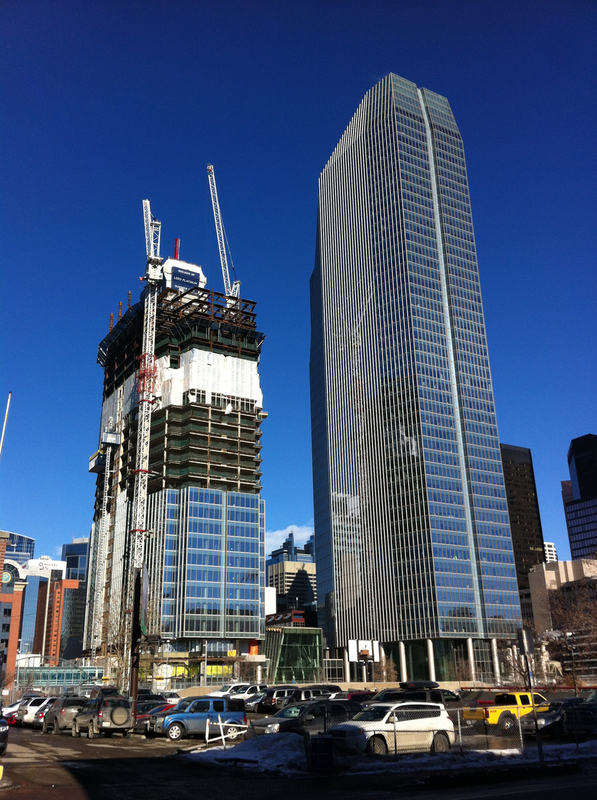 721 & 725 - 13th Avenue S.W. buildings provided a fashionable address. The decorative block-like dentils in the cornice are decorative vestiges of ancient building methods, when the roof beams protruded from the walls." Time to turn around, maybe walk on the other side of the street to get a different perspective. Looking for a place to grab a coffee, an adult beverage or a meal. Boxwood in Memorial Park is highly recommended, as is Yellow Door in Hotel Arts or the Good Earth Cafe on 4th street. Below area some old postcard images of the Calgary's 13th Ave SW Heritage Walk that allow you to see how the street has evolved. One of the many different landscape designs for Central /Memorial Park. 13th Avenue early 20th Century, no high-rise apartments, no tree lined streets. Memorial Park Library before the trees dwarfed it. Got my Gallerieswest summer ‘13 magazine in the mail this week – a good read as always. Jeffrey Spalding's column, "In My Opinion" always interests me as he has great insights and insider information. However, this one lacked the positive insights that usually characterize his rants. His laments about the lack of support for public art galleries in Calgary and Canada. 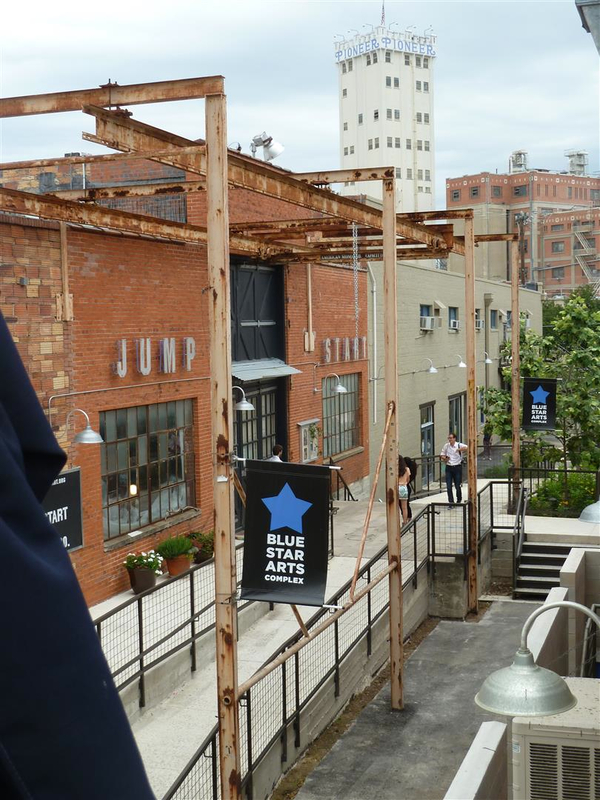 This is not a new cry as public art galleries and museums in Calgary have struggled for over 25 years. 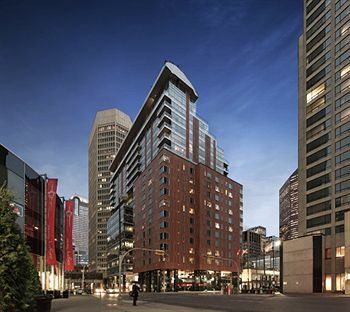 The Glenbow has never been in a strong financial position, which Spalding knows all too well as he served as the President & CEO from December 2007 to January 2009. The Art Gallery of Calgary too has struggled ever since they moved from the Memorial Park Library to their own building on Stephen Avenue. 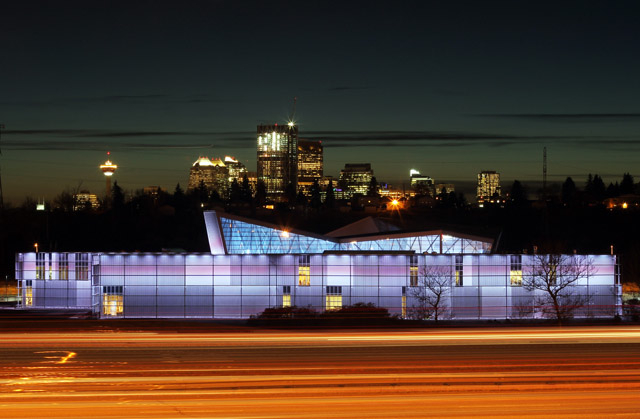 The Triangle Gallery now MOCA Calgary has struggled to find its place in the visual arts community for over 20 years. And the Illingsworth Kerr Gallery at ACAD or Nickle Galleries at the University of Calgary have never captured the public's imagination. 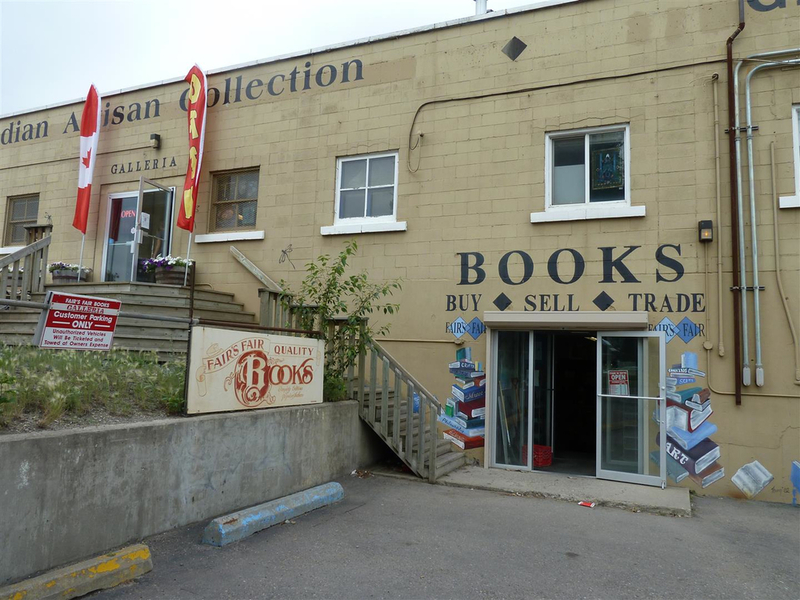 The idea of a true civic art gallery in Calgary has been debated to death for over 50 years and still nothing. Spalding’s position is "if you want vital public art museums, then the public has to pay for them, period." The corollary of this statement would be "if the public doesn't want to pay for them, why do we have so many public or quasi public art galleries?” Do we need a new model for public art galleries? Do we have too many public galleries? Does Calgary really need the Glenbow, Art Gallery of Calgary, MOCA Calgary, Illingsworth Kerr and Nickle Galleries? n opening night at the Esker Foundation Gallery. Interesting to note that for most visitors it is a quick look at the art and then stand around and chat. The gallery experience is 30 minutes at best for most people. One has to wonder why an individual visual arts patron decided to build and operate the Esker Foundation Gallery on his own dollar, rather than support and an existing public art gallery? Opened in June 2012, it’s one of the largest privately funded non-commercial gallery in Canada. Perhaps it is time to face the reality that the visual arts appeal only to a small fraction of the population. As a former Director/Curator of a public art gallery and a modest art collector, I know I don't go to the galleries as often as I should. And when I do go, it is often is a 30-minute experience at best. Calgary is a culture of recreation, not arts. That is not to say we don’t have some great theatre, music venues and festivals, or that we shouldn’t continue to foster our arts groups. However, what does it say when the city is building four recreation centers with a total price tag of $450 million, yet we struggle to raise $138 million for the National Music Centre. The City has also recently initiated a $25 million bike-friendly program and Calgarians are much more likely to spend $2,000 on a new bike than on a work of art. 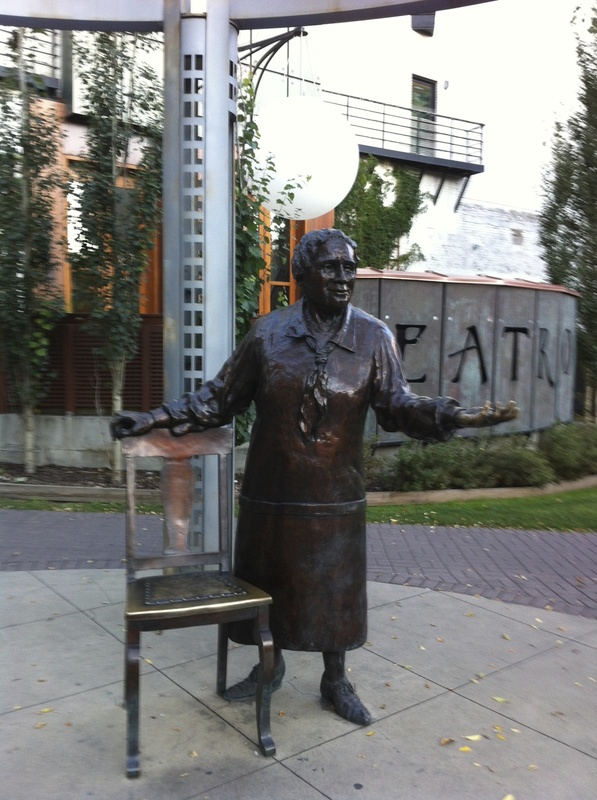 What does that tell us about Calgarians and their support for public art galleries? Calgary is home to perhaps North America's largest retail bike shop - Bow Cycle in beautiful downtown Bowness. Rendering of lobby of MARK on 10th condo with the Douglas Coupland artwork which will be visible to pedestrians on the sidewalk. 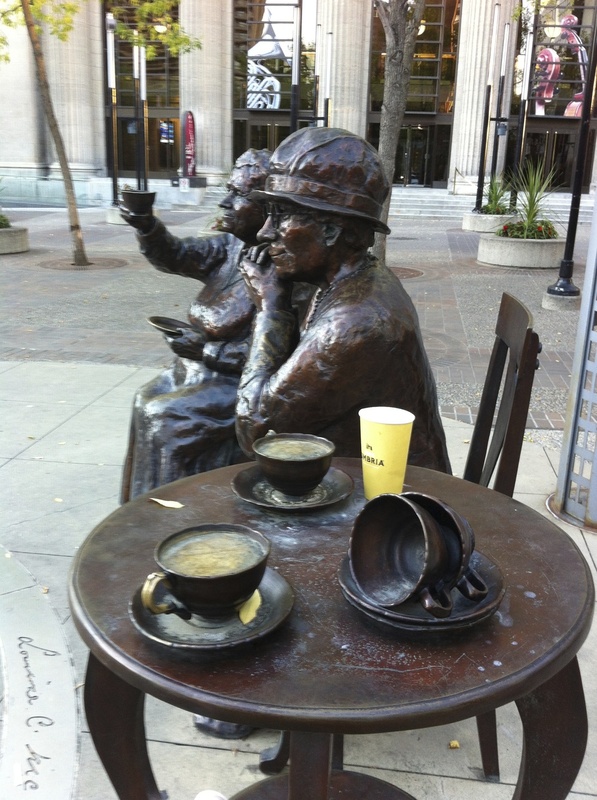 The City of Calgary has initiated a 1% for public art program (i.e. 1% of construction cost of all city capital projects must be set aside for public art) which means LRT Stations, overpasses and all City projects have public art included as part of their design. 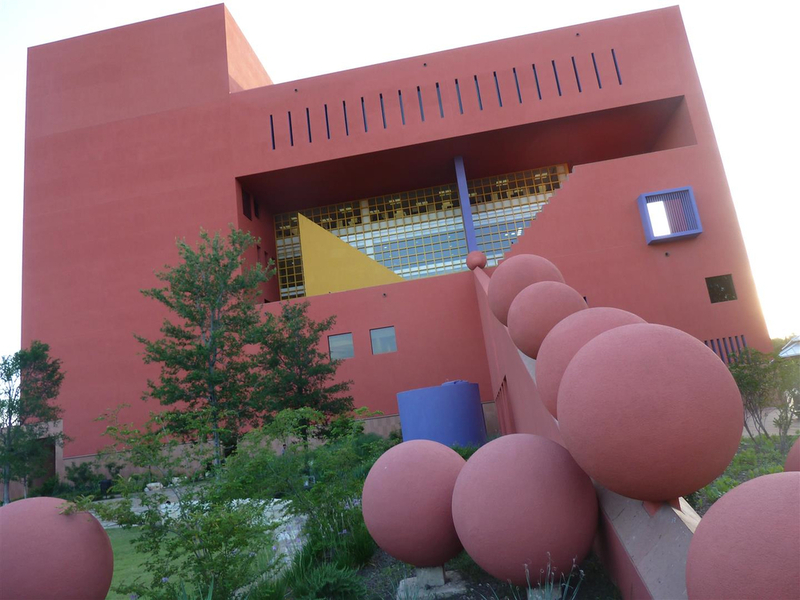 Over the past 10 years, the City has invested $12 million in public art and there is already $16 million in the hopper for future projects. 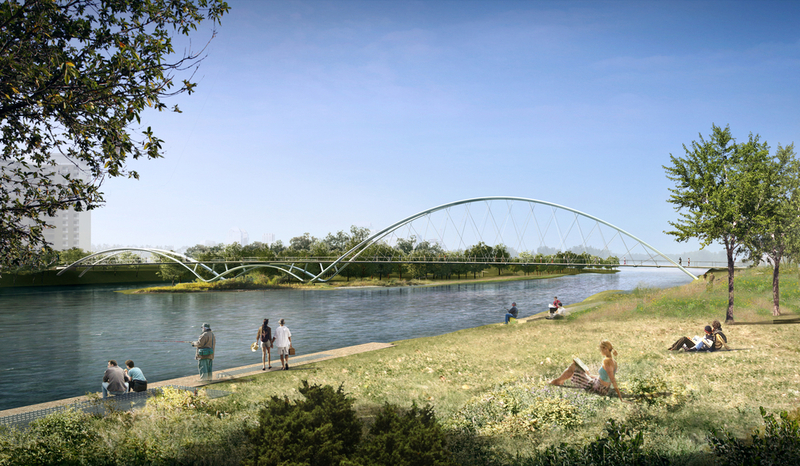 It could also be argued that the City has invested $50 million in two pedestrian bridges (Peace and St. Patrick's Island bridges), both of which are works of art. And back in 2000, Calgary hosted one of the most successful public art projects in Canada - Colourful Cows for Calgary. That summer, over 100 cows grazed in the downtown and other public spaces attracting thousands of Calgarians, as well as visiting family and friends downtown every weekend to see the wild, wacky and weird bovines. iver of Light project in 2010, attracted over 10,000 people to watch 500 orbs float down the river. It was magical! More recent a group of local artists transformed eight homes (that were about to be knocked down for a new development) into works of art. Wreck City attracted over 8,000 people to visit the temporary public art project in just one week. That would probably be more than the all of the other public and quasi-public art galleries in the city combined. Perhaps it is time to face reality! Times have changed it is no longer the early to mid-20th century which was the heyday for public art galleries and museums. In Calgary, and more and more other Canadian cities, the public-at-large just isn't into public art galleries. An example of the public art that can be found on almost every block of the downtown core and in many cases two or three. 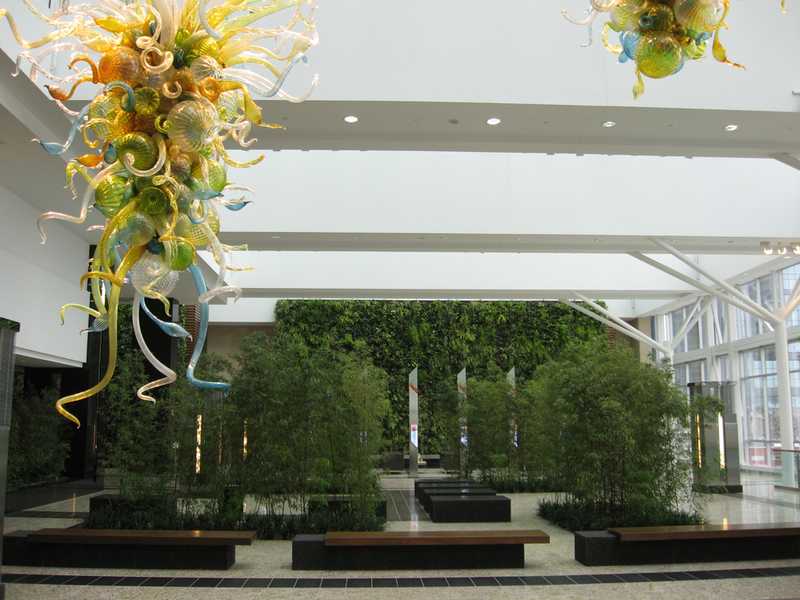 The lobbies of the office buildings are full of art, making the downtown a public art gallery without walls. I enjoy your continued focus on the clash between reality and ideology when we consider all the elements of city building. If people aren't engaging at length with public galleries, do we reconsider the intent or push forth with a dated concept? Love it! 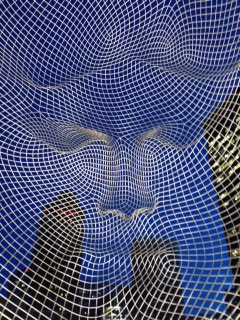 Last night I had some time before heading to the Palomino club to hear some some indie bands, so I decided to head over to the Norman Foster designed Bow office tower to checkout Calgary's newest public artwork - Alberta's Dream by Jaume Plensa. Unlike Wonderland the huge 12 meter ghost-like head that dominates the grand entrance to Calgary's largest and tallest office building, "Alberta's Dream" is an intimate sculpture tucked away at the back of the building. 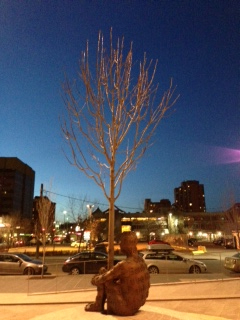 "Alberta's Dream" is a self-portrait cast of Plensa hugging a real tree. 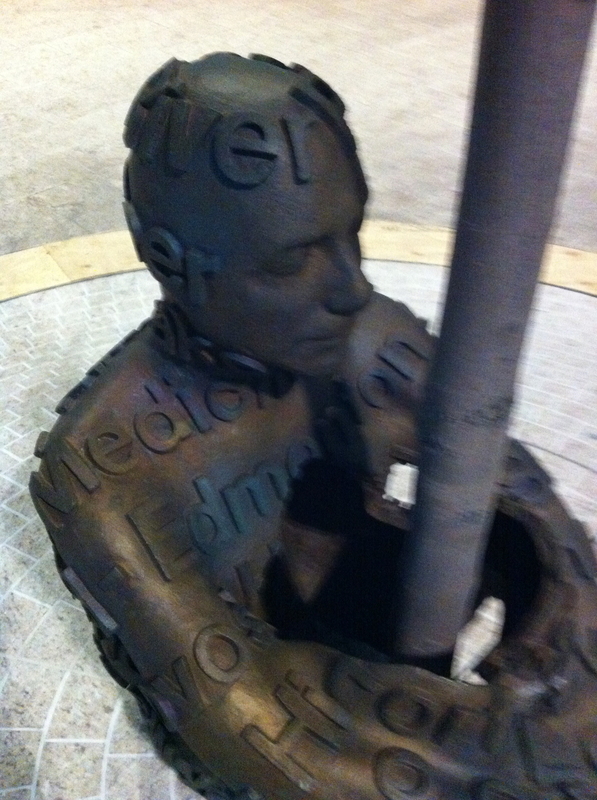 The bronze sculpture is covered with the names of numerous Alberta communities with Edmonton being across the chest and Calgary across the back. The piece is loaded with social and political references. It has already been renamed by the security guard who called it "The Tree Hugger" when I asked him where the new artwork was. Alberta can hardly be called a "Tree Hugger" province. I can already hear the environmentalists having fun with this artwork. And then there is the strategic placement of various Alberta city names on the body with Edmonton being across the heart and Calgary the backbone - coincidence? Unfortunately, Alberta's Dream and Wonderland don't speak to each other. I think it would have been interesting to have them both on the front plaza so they could visually play off of each other visually and intellectually. 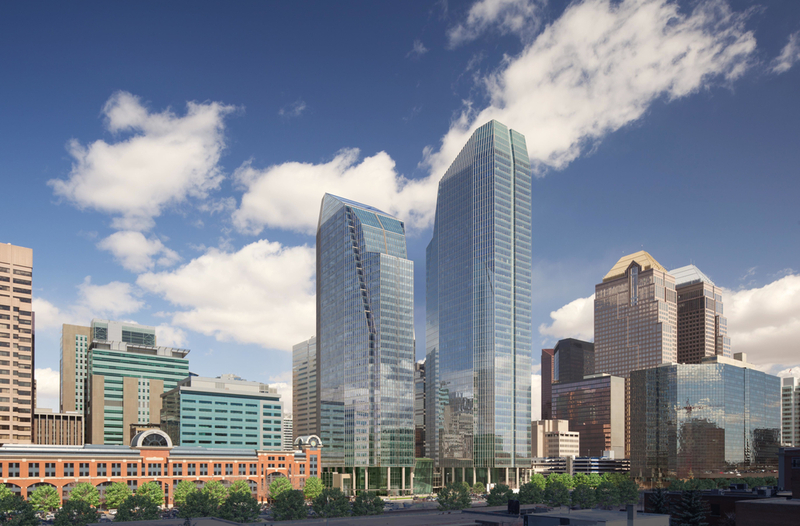 But then again maybe there is a message in the fact that these polar opposite views of Alberta and Calgary's sense of place/importance are on opposite sides of the building? 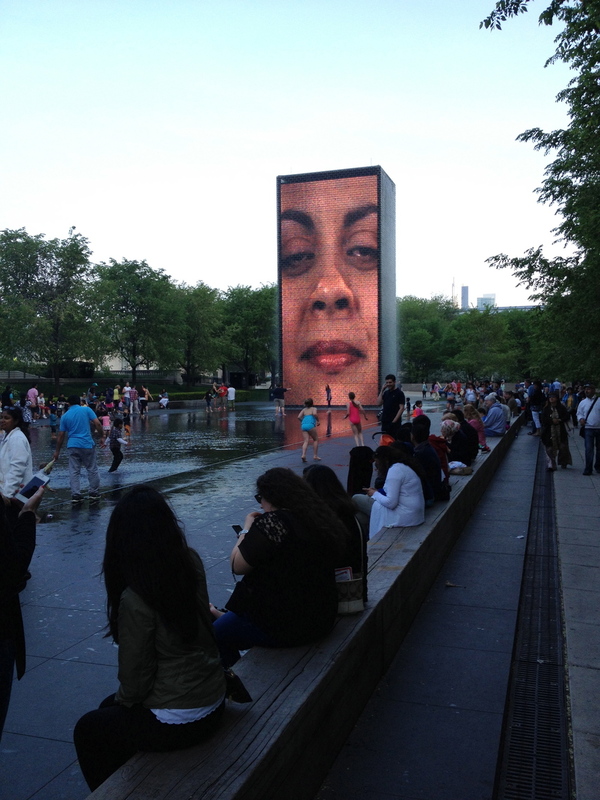 The two pieces will be a catalyst for conversation, which is what public art is all about! 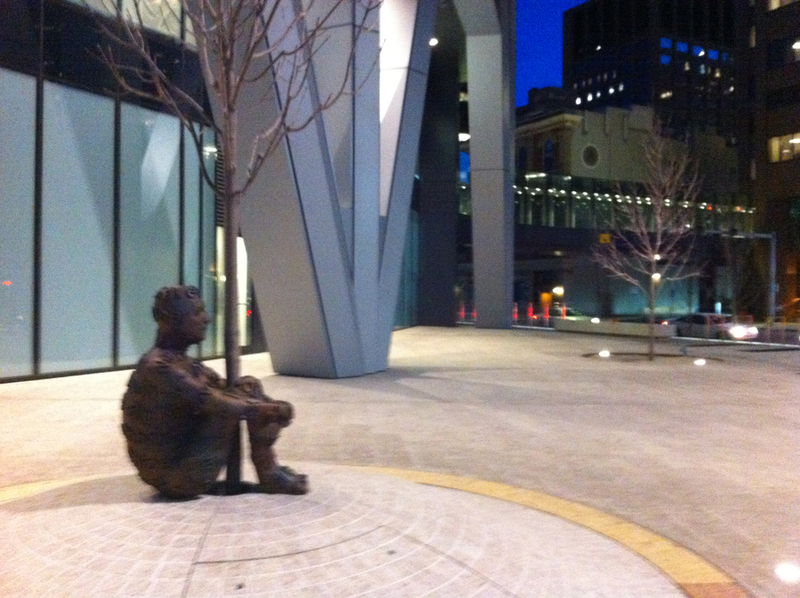 Alberta's Dream aka The Tree Hugger, sit all alone one the sidewalk/plaza on the back side of the Bow office tower. The political message is obvious. Another view of Alberta's Dream as the figure watches the constant stream of cars go by with its back to corporate oil and gas world behind him. The names of various Alberta cities are tattooed across the body of the figure with Edmonton across the chest and Calgary across the shoulders. 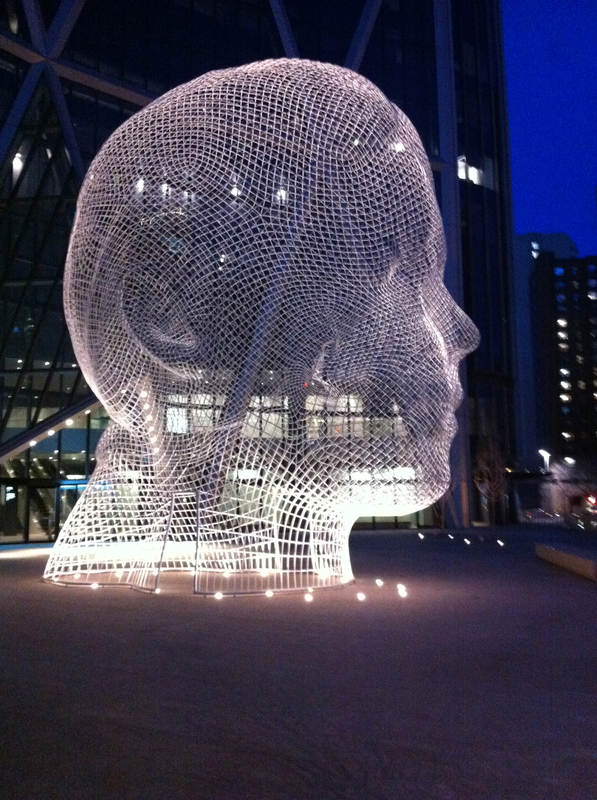 I thought I would add a couple of pics of Wonderland the other Plensa artwork to provide context for the two very different pieces of art he has created for one of Calgary's signature urban design projects. 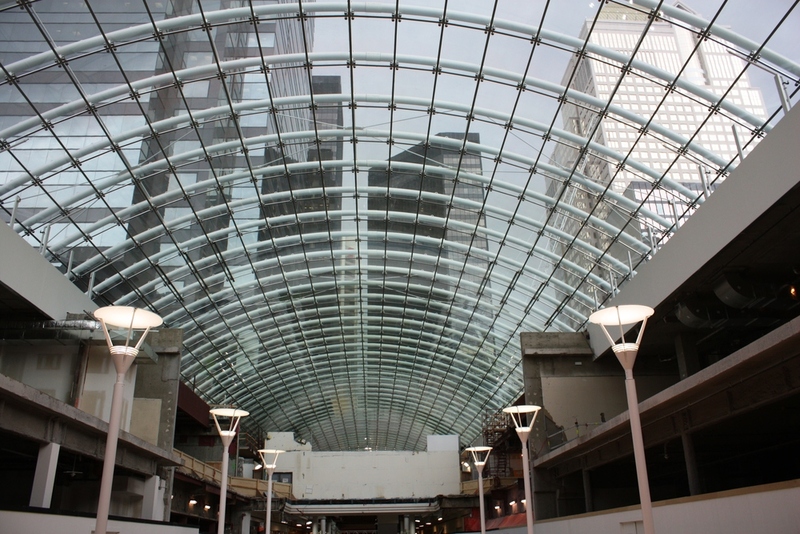 Calgary is quickly becoming one of the more interesting "Design Cities" of the 21st century. 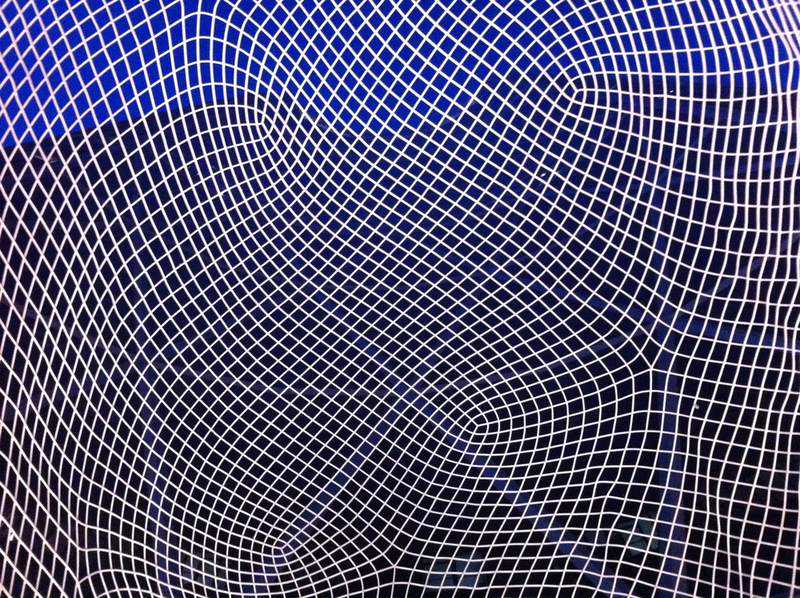 Inside Wonderland you can capture an infinite number of images as the light and angles change. There is a wonderful interplay of the figure and the architecture. This pic captures Calgary's rich blue sky at dusk that is very surreal. Wonderland breaks down to almost total abstraction at several points. 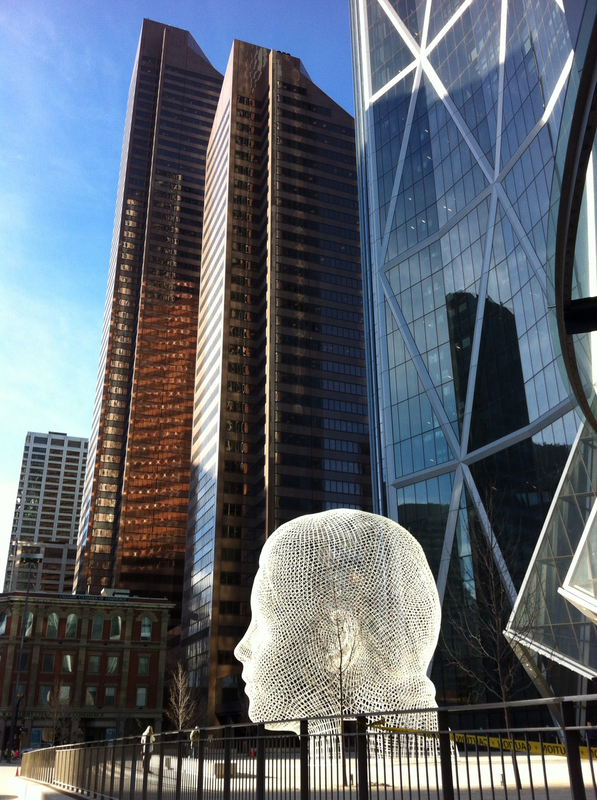 View of Norman Foster's Bow Tower from inside Jaume Plensa's Wonderland sculpture. Tim Williams won the 2014 International Blues Challenge in Memphis on Saturday, January 25, beating out seven other solo/duo finalists. To get to the finals, Williams had to perform twice in the quarterfinals and once in the semi-finals before a panel of three judges. Playing a combination of traditional blues songs by both well known and obscure bluesman, as well as his own compositions, Williams demonstrated he was the most well versed bluesman in the challenge (both solo/duo and band categories). Telling stories that only he could tell about the blues and picking on his well traveled mandolin and guitars, Williams impressed not only the judges, but the over 1,000 international blues fans who attended this year's Challenge. Williams carefully curated each of his performances with a focus on the Delta Blues which showcased his talents as passionate blues guitar player and historian. After listening to Williams play the first night, at the Jerry Lee Lewis bar's upper salon, the folks next to us from Springfield, Illinois quickly turned to us and said "Wow, he is very unique." As the challenge continued we heard words like "authentic," "traditionalist" and "a true bluesman" used to describe Calgary's adopted bluesman.